Pulse Jet Bag Filter | Baghouse dust collector | Apzem, India. Pulse Jet Bag Filter & Baghouse dust collector. ../../dust-collector-types/pulse-jet-bag-filter-01.png"alt="Pulse Jet Bag Filter Dust Collector"
Pulse jet bag filter is one type of Baghouse dust collectors using large array of filter bags for air filtering and high velocity pulsed air passed in reverse direction to airflow onto bags for cleaning. The other two types of baghouse dust collectors are shaker type bag filters and reverse air baghouse dustcollectors (not so commonly used). Of all the three types of baghouse dustcollectors, pulse jet is the most effective and economical type because of high air to cloth ratio, smaller size in comparison to other two of same capacity, continuous duty because of online cleaning advantages. For medium to heavy duty applications we highly recommend pulsejet dustcollectors. 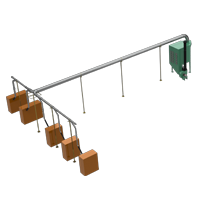 For smaller dust collection requirements & Intermittent duty, mechanical motorized or lever operated shaker type bag filter can be used. In industries like Pharma & Food industries, instead of bag type, we highly recommend using our cartridge filters dustcollectors for dust or particle separation upto 99% of submicron particles. 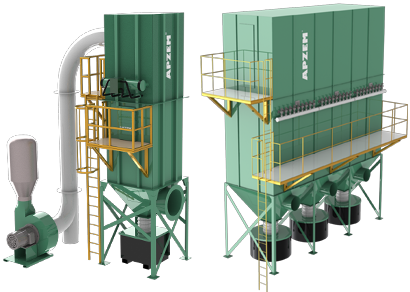 Air to cloth ratio, can velocity, temperature, particle size distribution and dust loading, moisture content, dust nature (corrosive, combustible, Explosive, sticky etc) are some of the most important parameters to be considered for effective and efficient dustcollector design & it determines the size, cost and performance of Bagfilters. We are the manufacturers of custom designed pulse jet bag filter and baghouse dustcollectors for various industrial applications. Our engineers have decades of experience and deep knowledge in custom designing dustcollector & Dust collection system very specific to process dusts and particle matter after thorough understanding of your process parameters and considering all above said parameters. 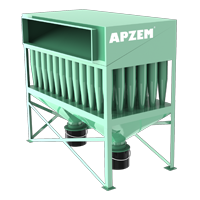 Apzem pulse jet Bag filter dust collectors are designed to capture even finest dusts in Industrial flue gas & process exhausts and are designed with timed pulse cleaning & on demand cleaning that cleans based on pressure difference between clean air side and dust air side. All Apzem products are build with outmost quality and efficiency complying to national & international quality and emission standards. We also provide a complete dust control solution from designing hood, ducts , dustcollectors with Blowers and Chimney based on your requirements. Processes with light or medium dust loading etc..